Could This Old School Mercury Capri Pull $8,500? Today's Nice Price or Crack Pipe Capri is the second European Ford to carry that name, and the second Lincoln/Mercury car to do so as well. Could this one also be priced to merit a second look? How low could you go? Well, according to to 90% Crack Pipe vote it received, yesterday's chopped and modded 1973 Volvo P1800ES will need to go a lot lower on its price if it wants to find a new home. Speaking of homes, check out what's in the driveway of this Missouri manse. That's right, it's a 1973 Mercury Capri. When was the last time you saw one these on the road? I'd wager that for some of you young'uns, the answer would be never. Ford first applied the Capri name - taken from the Italian isle sitting just south of Naples - to a Lincoln coupe. That model ran from 1952 until '59. Two years later, Ford resurrected the Capri name for another coupe, the British-built Consul Capri, which lasted until the '64 model year. In 1969 Ford applied the Capri name once again to a coupe, this time one that took the company's successful Mustang pony car recipe and adjusted the ingredients for a less expansive European palate. The Ford Capri was built off the Cortina platform in the same manner that the Mustang had been brought forth from the Falcon, bringing life to the mantra of form following function. The only thing, with the Capri it was all in ¾-scale. And when it came to model diversity, the Euro-pony offered buyers 2/3rds fewer with only a semi-fastback coupe made available. Engines were of course smaller too. In fact, the smallest engine offered in the 1st generation Mustang was a 170-CID straight six, which equates to about 2,785-ccs, while the LARGEST mill in the '69-'74 Capri was the 2.8-litre Cologne V6. Freaky, I know! This one is a V6, but being a '73 that means it's a 107-horse 2.6-litre underhood. This model year was also the last before the car's bumpers got bee-stung big. The later Capri II's bumpers were also big and ugly, even though that car was a total re-skin. The front blade here however, only sticks out a little further than did that of the earlier years' models, and it's not too ungainly. The same can't be said for the jacked-up shackles in back and the oversized meats on both ends. The Capri may have been a pony, but I think it looks much better as a Euro-vibe sport coupe with some decent alloys, like maybe some Pannies or the like. The jacking is probably part of what the ad describes as an older restoration. How long ago was that? Well, apparently one driver's seat ago as the pilot's seat is looking a little worse for wear. Mileage is said to be a meager 78K and aside from the seat, the cheap steering wheel, and the Foose floor mats (seriously? ), everything on the inside looks to have held up well. The outside is equally tidy and the ad notes that the car runs well. Much like other sporty imports of the era, the Capri was built to a price, and the people who tended to buy them down the road weren't typically those with the means to maintain them. That's why you don't see these any more, and is what makes this one kind of a cool find. Well, that and the fact that these are handsome cars. This one's $8,500 and good luck finding another to price compare against. You're better off looking at other sporty coupes form the era - Opel Mantas, Toyota Celicas, etc. - and do a comparo there. 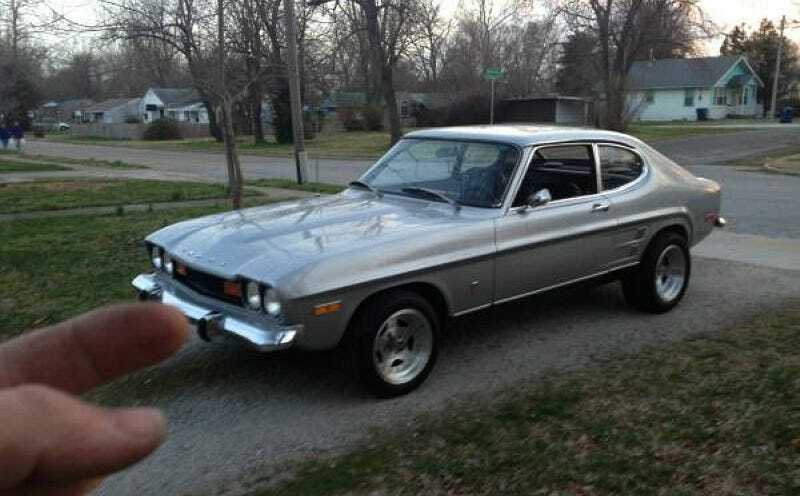 With that in mind - and having copiously studied the ad, what do you think about $8,500 for this classic Capri? Does that seem like a good deal? Or, is that just a crapi price?